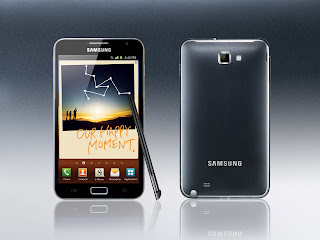 Android Smartphone: Samsung Galaxy Note.. Galaxy BEAST more like. Screen sizes are definitely creeping up on phones, and it's not uncommon to see panels of 4" or more. Well, the people who designed the Samsung Galaxy Note obviously thought that this still wasn't enough, so have stuck a massive 5.3" panel on this particular Android device and have combined it the with seriously grunty dual-core underpinnings. To be blunt - this is a beast of a phone. It's about 50% bigger than the Galaxy S II, itself a big phone. Samsung say that the Note will easily fit in a pocket.. I suspect that must have damned big pockets in South Korea. One other odd feature is the stylus. We haven't seen one of those in a phone for a long time, we're not convinced that it will actually be that useful, but perhaps in a smaller device it might be. We don't know when it will be available, and it's likely to be restricted to Europe and Asia only when it does come. And it is likely to be very, very expensive..